HOUSTON (Reuters) - Teen-age boys, are you tired of embarrassing questions about when you last changed underwear? Japan's space scientists may have just the answer -- a line of odour-free underwear and casual clothing. 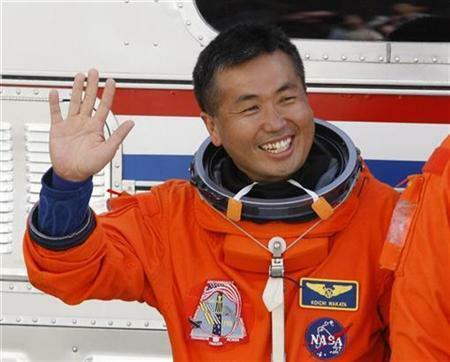 Koichi Wakata, the first Japanese astronaut to live on the International Space Station, is testing the clothes, called J-ware and created by textile experts at Japan Women's University in Tokyo. J-ware should reduce the amount of clothing that needs to be sent to the space station, which has no laundry facilities. Toting cargo into orbit is expensive, so having clothes that stay fresh for weeks at a time should result in significant savings. Taya also is working with clothing manufacturers Toray Industries and Goldwin. on clothes that have a microscopically thin chemical layer in the materials. Wakata, who arrived at the station last week for a three-month stay, said on Sunday that the clothes appear to be working. "Nobody has complained, so I think it's so far, so good," Wakata said.